Oh boy, were these cheesecake bars yummy! 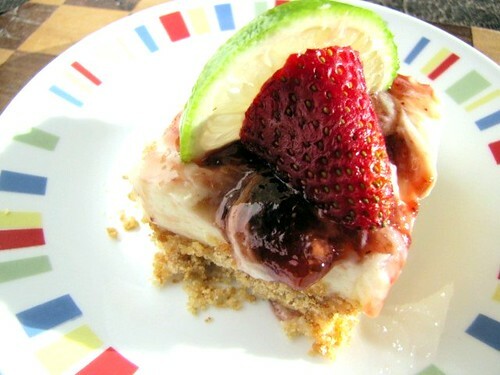 The tang of the lime and the sweet strawberry preserves and the creamy filling makes for a rich and satisfying dessert. You could even use raspberry preserves if you have some on hand. Super quick to throw together, it can be made into bars or even into a pie, whatever suits your fancy. Impress your family and even guests with very little effort, now that’s my kind of dessert! Pre-heat oven to 325 degrees. In an 8″ x 8″ baking pan, melt butter, stir in graham cracker crumbs and sugar. Mix well and press evenly over bottom of pan. Bake 5 to 8 minutes or until crust just starts to brown. Remove from oven to cool. In a large mixing bowl, add cream cheese, sweetened condensed milk, lime juice and zest. Beat with an electric mixer until smooth and well combined. Pour over cooled crust. Spoon strawberry preserves over cream cheese mixture and use a butter knife or spatula to create a marble like swirl. Chill for at least 6 hours. Cut into squares and serve with fresh strawberries and a slice of lime. Cover and refrigerate leftovers. Okay, so leftovers are not likely, but just in case.